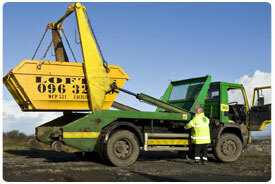 We provide skips to private and commercial customers and building contractors throughout Mayo and Sligo. Contact us to discuss your requirements and we will arrange delivery of a skip that best suits the job. We provide standard open skips but can also supply closed skips with lids. These skips may suit customers in urban areas who can lock the skip when it isn’t in use, preventing any unauthorised use. We strive to deliver our skips within 24 hours but during busy periods delivery may take longer.